A hundred years ago, the Amazon princess Diana (Gadot) is living on the paradise island of Themyscira alongside her mother Queen Hippolyta (Nielsen), aunt General Antiope (Wright) and an all-female culture of vying factions. 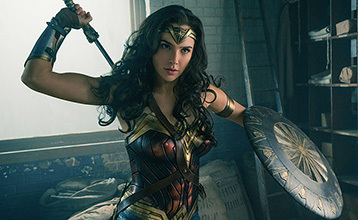 When worldly and cynical fighter pilot Steve Trevor (Pine) lands on their shores with the First World War at his back she resolves to leave, join the world and help put a stop to it… Unlike the experienced, super-confident warrior seen in ‘Batman v Superman’, here Diana is a young idealist, naive and pure. She’s a demigoddess whose father was Zeus, in line with rebooted comic series. The villains are rumoured to be Circe/Doctor Poison (veteran Spanish actress Elena Anaya, half-masked in the trailer) working towards a more corrosive WW1 gas, and Ares (Huston) a German general whose alter-ego is the God of War, manipulating the conflict. Lucy Davis (‘Shaun of the Dead’) provides comic relief as Steve Trevor’s secretary, who befriends Diana. Director Patty Jenkins made the Oscar-winning ‘Monster’ but is new to action (it’s the first summer tentpole superhero film directed by a woman). History has shown Wonder Woman is a hard concept to get right but it seems the time has come, with rumours of a messy production and Gadot’s wooden acting offset by a rocking trailer and effective plotline (echoing ‘Captain America’s involvement in World War 2). Secure within a desolate home as an unnatural threat terrorises the world, the tenuous domestic order he (Edgerton) has established with his wife and son is put to the ultimate test with the arrival of a desperate young family seeking refuge. Despite the best intentions of both families, paranoia and mistrust boil over as the horrors outside creep ever-closer, awakening something hidden and monstrous within him as he learns that the protection of his family comes at the cost of his soul… The nature of the threat is unknown, but it involves gas masks, black bile and satanically-large pupils. The director’s dramatic debut feature ‘Krisha’ scored a 97% on Rotten Tomatoes and had numerous top critics proclaim him the next great American filmmaker. Joel Edgerton showed in ‘The Gift’ that he can give a great performance in dark paranoid material, and producers A24 previously distributed ‘The Witch’. The well-crafted trailer is stylish, atmospheric and unsettlingly creepy. 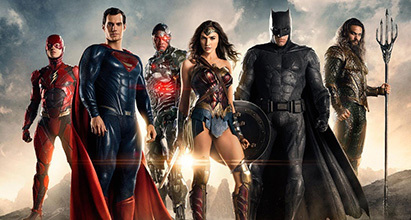 Fueled by his restored faith in humanity and inspired by Superman’s selfless act, Bruce Wayne (Affleck) enlists the help of his newfound ally, Diana Prince (Gadot), to assemble a team of metahumans to face the catastrophic threat of Steppenwolf (Hinds) and the Parademons (seen in Bruce’s nightmares during ‘BvS’) who are on the hunt for three ancient Mother Boxes on Earth… The Justice League roster will include Aquaman (Momoa), king of the undersea nation of Atlantis, Flash (Miller), a police forensic investigator who can move at superhuman speeds, Cyborg (Fisher), a former college athlete made half cybernetic after an accident, Superman (Cavill) in a sun-absorbing black suit, and potentially a touch of Green Lantern. Returning director Zack Snyder, of the divisive ‘Batman v Superman’, says it’s inspired by the New Gods comic series by Jack Kirby. Darkseid will appear in a flashback sequence in which ancient Amazonians, Atlanteans, and pre-historic humans fight him and force him off of Earth. Ciarán Hinds plays Steppenwolf, Darkseid’s uncle, who is charged with hunting down the three all-powerful Mother Boxes; located in Atlantis, Wonder Woman’s homeland Themyscira, and within Cyborg. Amy Adams, Jeremy Irons and Jesse Eisenberg will reprise their roles as Lois, Alfred and Lex Luthor. Somewhat amusingly, 67-year-old J.K. Simmons will be an extremely muscular Commissioner Gordon. Amber Heard also joins as the Queen of Atlantis and Willem Dafoe as Nuidis Vulko, a political operator in the court of Atlantis. Criticism of the darkness in ‘BvS’, where darkness wasn’t the problem, could push this into more jokey, campy territory. Hopefully not too far. In 1971, during the Vietnam war, a group of explorers (including a resourceful ex-SAS officer (Hiddleston) and a peace-driven photojournalist (Larson)) venture deep into an uncharted island in the Pacific, unaware that they are crossing into the domain of the mythical giant gorilla known as Kong, and other enormous strange monsters. Soon they will be fighting to escape the island alive… This reboot is intended, along with 2014’s Godzilla, to set up a giant monster “universe”, ala the Marvel universe. Kong here is bipedal and far bigger (100ft) than Jackson’s version (25ft), which is necessary if there’s to be an even fight in the 2020 ‘Godzilla vs Kong’ movie (Godzilla is 350ft). 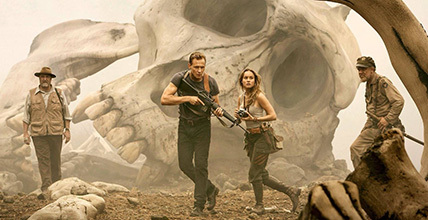 It’s theorised that since ‘Skull Island’ is set in the ’70s and Godzilla is present day, Kong may continue to grow in time for their match up. Don’t be surprised if he has some supernatural abilities too in this “kaiju” version. The director’s only previous feature credit is the small coming of age drama ‘Kings of Summer’, which was good but barely seems like preparation for this $190 million (!) project. Cast-wise, nobody monologues like Sam Jackson, his work in the trailer sends a chill. John Goodman and Brie Larson are both coming off the back of career best performances in ’10 Cloverfield Lane’ and ‘Room’ respectively. The great lineup also includes John C. Reilly and the actors who played Dr. Dre and Eazy E in ‘Straight Outta Compton’. A King Kong reboot with the sole purpose of having him fight Godzilla? It’s not art, but I like it. 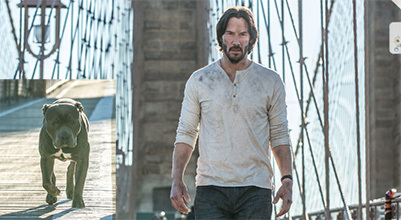 Legendary hitman John Wick (Reeves) is forced back out of retirement by a former associate plotting to seize control of a shadowy international assassins’ guild. Bound by a blood oath to help him, John travels to Rome, where he squares off against some of the world’s deadliest killers… His main adversary is the head of security (Common) for a female (androgynous-looking) crime lord (Rose). Ian McShane returns as the owner of the Continental Hotel, Bridget Moynahan as John’s deceased wife, and John Leguizamo (who has a curiously brief role in the first movie) as the owner of the high-end chop shop. Laurence Fishburne (‘Matrix’ reunion!) joins as The Bowler King, a powerful and ruthless gangster. Peter Stormare is another new addition to the mix. The first ‘John Wick’ came out of nowhere and was really the perfect videogame movie, capturing their ballistic appeal and artistry, even though it wasn’t based on one. It had a great aesthetic, an urgency, and terrific fight choreography. That’s something in Reeves’ skillset which is often overlooked – he was fantastic in ‘The Matrix’ fight sequences, and with ‘Speed’ and ‘Point Break’ under his belt he’s quietly been a king of action for three decades. Sequels to his action properties, from ‘The Matrix Reloaded’ to ‘Speed 2: Cruise Control’, have showed a steep drop in quality, and Common as the villain here isn’t the actor Mikael Blomkvist was. However with the same writer and director back on board (the latter of which has been a top stunt coordinator since his break as Reeves’ stunt double in ‘Point Break’), expect this to deliver. 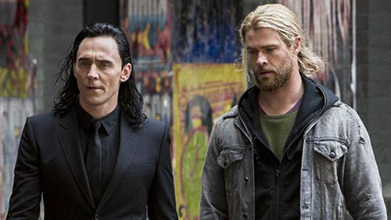 Chris Hemsworth and Tom Hiddleston return, picking up where Thor was left off in ‘Age Of Ultron’. Loki will probably still be on the throne, having tricked his way into replacing Odin at the end of ‘The Dark World’. Marvel’s Kevin Feige has underlined that Ragnarok means “the end of all things”, and the movie will have big implications for the Marvel Universe going forward. “We plan on taking Thor to another level,” he says. The term “Ragnarok” crops up in the comics a few times, once as the name of Thor’s clone, but the closest likely reference is the storyline where the Gods of Asgard are killed… Cate Blanchett has been cast as Hela, who in the comics rules over the souls of those who didn’t die in battle and, in her attempt to collect the rest, teams with Loki to banish Thor from Asgard and destroy his hammer. Mark Ruffalo has revealed that Hulk will team up with Thor and it becomes a “universal road movie”, which could mean the two of them trying to get back to Asgard together (Marvel says they’ve devised an arc for Hulk running from ‘Thor: Ragnarok’ through ‘Infinity – Part II’ that’ll feel like a Hulk movie when the three parts are added up. Unconfirmed rumours suggest a loose adaptation of ‘Planet Hulk’). Blanchett’s Hela may also become a physical embodiment of Death, and so become the obsession of Thanos. Samuel L. Jackson is back as Nick Fury. Director Taika Waititi was part of the team behind ‘Flight Of The Conchords’ and helmed the highly-amusing ‘What We Do In The Shadows’. However he has no action or thriller experience whatsoever so his appointment is strange. One thing’s for certain, it’ll be the funniest Thor movie, despite its dark material. 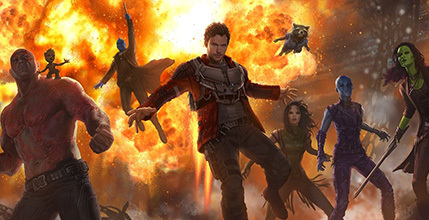 Set to the backdrop of Awesome Mixtape #2, the team’s adventures continue as they struggle to keep their newfound family together and unravel the mystery of Peter Quill’s true parentage… Nebula (Karen Gillan), the adopted daughter of Thanos is now an uneasy member of the Guardians, and her sisterly relationship with Gamora (Saldana) will be further explored. Yondu (Michael Rooker) has a big new headpiece and also graduates to official member of the Guardians. Pom Klementieff (French actress from ‘Oldboy’) is introduced as Mantis, a Kree prisoner who, in the comics, ended up in a counselling role for the group, given her mind powers. Kurt Russell plays Ego, aka “The Living Planet” who in the comics is literally a planet with a face and a beard. Here he won’t appear in his planetary form, but rather as an ancient and mysterious cosmic-being assuming a humanoid guise. Matthew McConaughey was offered the villain role but turned it down, whoever accepted is yet to be revealed. Unfortunately John C. Reilly won’t be back, Sylvester Stallone has a small but “key” role as a Nova Corps member instead. As ‘Vol.2’ is set only two months after the first, Groot still has a lot of growing to do. Returning director James Gunn says it won’t be based on any particular graphic novel. The original movie was colourful and inventive, and this looks like more of the same.